CHEFS BRADLEY AND BRYAN OGDEN’S Hops & Harvest Now Open at Tivoli Village: Noted chef Bradley Ogden, along with partners chef Bryan Ogden, Tony Angotti and Bill Feather, Frank Tucker and Kelley Jones of Epicurean Ventures, LLC, a hospitality management company, announce the opening of Ogden’s Hops & Harvest, an upscale casual pub in Summerlin’s Tivoli Village. Ogden’s Hops & Harvest is a 180-seat loft-like, contemporary space with spacious outdoor dining. The restaurant showcases Ogden’s well-known dedication to fresh ingredients and farm-to-table fare. 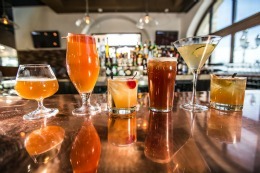 Beverages include handcrafted cocktails, craft beer [draught and bottle], and an All-American wine list including eight on tap. A few ways to begin a meal might be: Grilled Cheese Bites served with tomato herb sauce; Short Rib Nachos made with melted cheddar and horseradish sour cream; and Iva’s Fried Chicken Salad, a dish made with gemstone lettuce, pickled beets and a creamy buttermilk herb dressing. Sandwiches such as Short Rib & Pork Belly Patty Melt with provolone, Gruyère, mushrooms and “fancy sauce”; and Bradley’s Meatloaf Sandwich, a twist on the classic dish, served with garlic mashed potatoes on a toasted bun give diners an authentic pub-style experience. Beer Battered Fish and Chips with hand-cut fries and Bradley’s tartar sauce and a classic Steak and Potato dish are hearty additions to the Hops & Harvest menu. For dessert, try Bradley’s acclaimed Butterscotch Pudding served alongside warm snicker doodle cookies or Cinnamon-Sugar Donut Holes served with milk chocolate custard. DINE UPSCALE AND UP HIGH with Dinner in The Sky Las Vegas: Dinner in the Sky Las Vegas officially began construction today with a groundbreaking ceremony at an 8.8 acre site minutes away from the Las Vegas Strip. The one-of-a-kind upscale dining attraction serving meals 180 feet in the air is scheduled to open later this summer. RON DE JEREMY RUM Hosts Events In Las Vegas June 12th, June 13th and 14th: On June 12th, 13th and 14th, actor, pop culture icon, performer and now distiller Ron Jeremy will visit 2 Lee’s Liquor Store locations from 5:00-8:00pm on June 12th and 13th as well as make nightclub and casino appearances at the Hustler Club, Stagedoor Casino and Mandalay Bay Resort. He will be autographing bottles of Ron de Jeremy Spiced Rum and Ron de Jeremy Aged Rum. This marks the first time that Jeremy, known for his work in the adult entertainment industry and in films including The Boondock Saints and Ghostbusters, has been involved with a rum. The new Ron de Jeremy Spiced Rum, bold and flavorful at 94 proof, delivers a signature long, smooth finish. 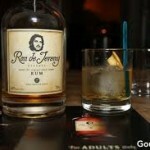 Ron de Jeremy Spiced Rum and Ron de Jeremy Aged Rum are available wherever fine wine and spirits are sold. LOCATION: Stagedoor Casino 4000 Audrie St.